Sir Ben Ainslie helped raise over £16,000 for the Andrew Simpson Sailing Foundation during a dinner and auction held at The Royal Motor Yacht Club in Sandbanks, Poole. The event was hosted by the South Coast accountancy firm Princecroft Willis and was the latest of a series of charity events held to mark the firm’s centenary year. A staggering £16,665 was raised on the evening and, with donations still coming in, the total is expected to exceed £20,000. Four times Olympic Gold medalist Sir Ben Ainslie was a special guest at the dinner along with Richard Percy, CEO of the Andrew Simpson Sailing Foundation. 120 of Princecroft Willis’ clients and contacts also attended the event and made donations to the foundation throughout the night. 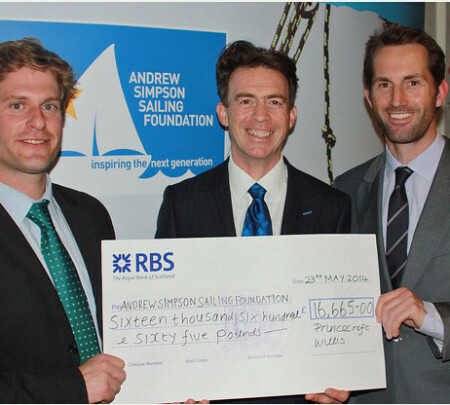 The Andrew Simpson Foundation was launched by Sir Ben Ainslie, Iain Percy OBE and Andrew Simpson’s widow Leah after her husband died during a training accident in May 2013. The Foundation has already funded the Andrew Simpson Sailing Centre at the Weymouth and the Portland National Sailing Academy.